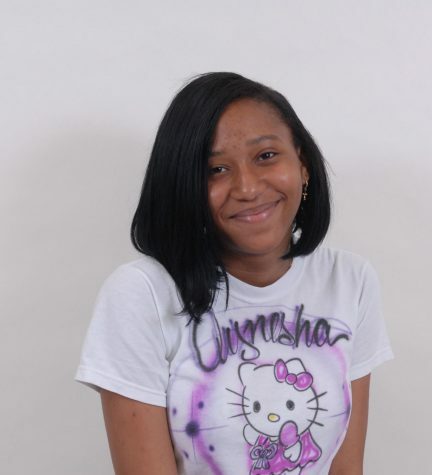 Qynesha Pierre is a freshman at South Broward High School, who is a very shy and quiet person. Pierre does not participate in any clubs because she wants to make sure she focuses on her grades, but while she's out of school, she enjoys playing basketball, sleeping, and cooking. Qynesha currently does not know her passion but is hoping to find it soon. She enjoys listening to music such as R&B, Rap, and Hip Hop and dislikes Country music. Cardi B, Rihanna, and Beyonce are just a few of her favorite artists. She used to be in the band in middle school and played the flute. Pierre's favorite movie is Moana, and her favorite food is Shrimp Alfredo pasta. If she could visit three places, she would visit the Virgin Islands, Hawaii, and Paris.